Market State 2 takes place roughly 17% of total trading days, making it the 2nd most common Bullish Market State Environment. The daily standard deviation of returns (annualized) is 12.85% while in Market State 2.This is the 2nd lowest standard deviation of all Bullish Market States, and 3rd lowest overall.Standard deviation is an indication of how many outlier days can be expected.The lower the standard deviation, the less likely an “outlier” day will occur. Canterbury Volatility Index (CVI 77): Canterbury’s indicators, which are placed on CVI, have now turned positive. This is due to decreasing volatility over the past few weeks. Volatility indicators turned negative on February 2nd following a spike in CVI. CVI climbed as high as CVI 102 in early April, and began decreasing, turning from negative to cautionary in late April. The current indicators on the CVI level are positive. A decreasing volatility level (CVI) is a primary indicator that the probabilities of experiencing outlier days are decreasing. 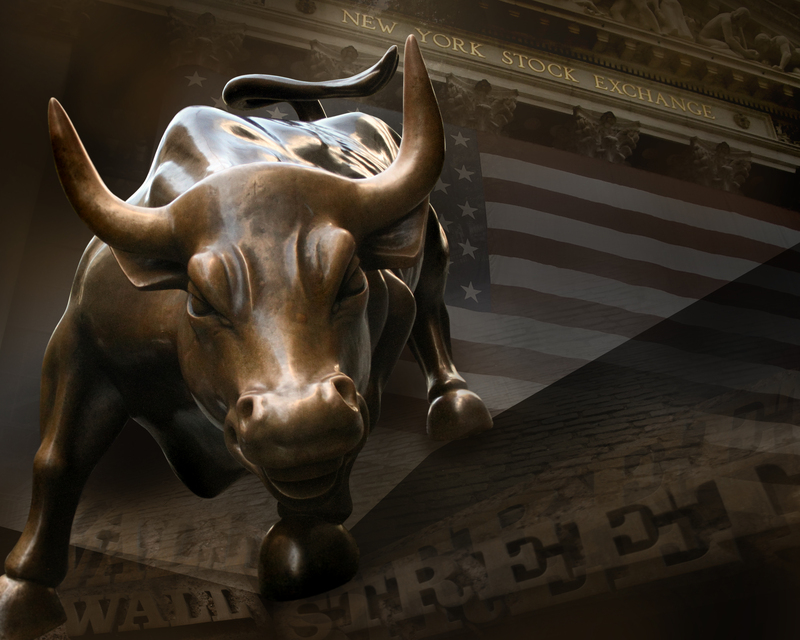 We have now been in a Bull Market State since April 25th. A Bull Market State indicates that risk levels are limited. Canterbury’s volatility indicators (measured using CVI) recently turned from cautionary to positive. Canterbury defines an outlier day as being +/- 1.5%. Below is a chart of the daily returns of the S&P 500 from August 1st, 2017 to May 18, 2018. The colored backgrounds represent Canterbury’s indicators on volatility—green is positive; yellow is cautionary; red is negative. As can be seen from the above chart, Canterbury’s indicators on volatility were positive up until February 2018. 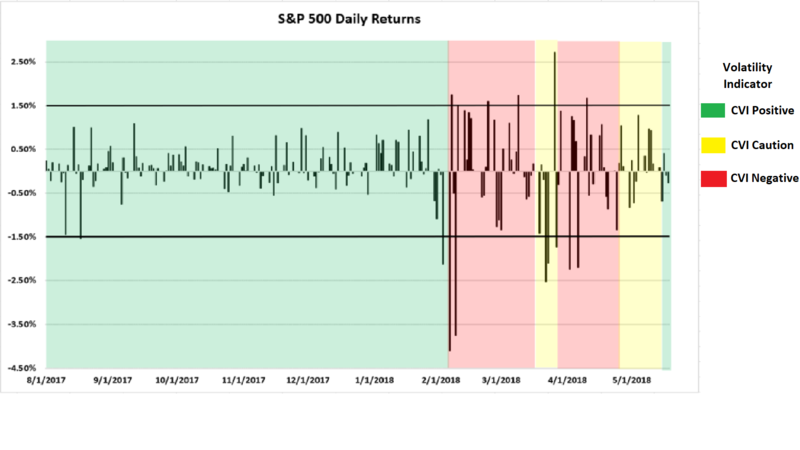 While positive, the probability of experiencing an outlier day is low and daily returns generally fell within a narrow range. As the volatility indicators turned from positive to negative/cautionary, the probability of experiencing an outlier day increased. This is a characteristic of high or increasing volatility. Below is a chart of CVI over the same time frame. 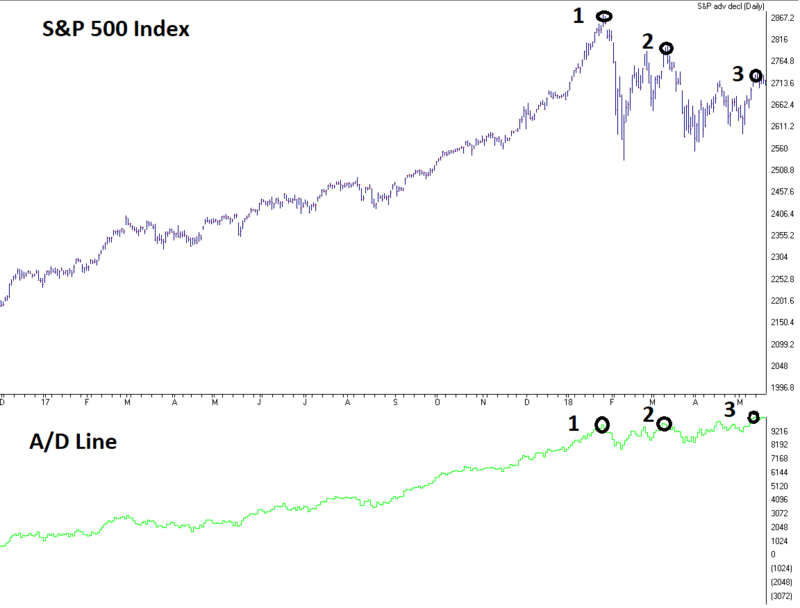 Compare this chart to the prior chart of daily returns. Notice how high and increasing CVI leads to outlier days while low or decreasing CVI is a sign of rational fluctuation. Recently, the advance-decline line (A/D Line) reached a new all-time high. The A/D Line is the difference between advancing stocks and declining stocks. As has been for the last few months, the A/D Line is showing a Positive Divergence. A positive divergence occurs when the market being measured (in this case, the S&P 500) puts in a lower high, but the A/D Line puts in a higher high. This can be seen in the chart below. We can see that the Market puts in a new high in price and at Point 1 while the A/D Line also puts in a new high at Point 1. The market then puts in lower relative price highs at points 2 and 3 while the A/D Line puts in higher highs at Points 2 and 3. This is a bullish indication showing that the troops are leading the market as opposed to only a few “generals” carrying the market while the troops fall behind. Low and decreasing CVI is a Bullish characteristic. Bear markets do not happen with low and decreasing CVI. Canterbury’s indicators on volatility show that volatility is positive. This means that the probabilities of seeing “outlier” days are lower. Outlier days can still occur at these current levels of volatility, but their likelihood is decreased. The A/D Line continues to show a positive divergence, which is another indication of a bull market. The market “troops” remain strong. Investing is a process. While this commentary is based on broad market analysis, keep in mind that all assets go through both Bull and Bear markets. Styles, sectors, countries, commodities, bonds, and other asset classes will all have periods of being in favor and out of favor. Managing markets require a process for identifying those assets that have favorable probabilities of reduced risk with upside potential, while avoiding asset classes that show unfavorable characteristics of high and increasing volatility. Canterbury continues to monitor all asset classes on a daily basis and will make the necessary adjustments that will keep your portfolio Bullish.